New Zealand Weddings Fashion Show at Cordis Heartfelt Weddings Showcase from New Zealand Weddings Magazine on Vimeo. Couldn’t make it to the Cordis Heartfelt Weddings Showcase last year? Lucky for you, it's on again for another year. Click the link below to find out more. Last year, The Cordis Auckland opened its doors to brides, grooms and their friends and family to enjoy a day out perusing the many luxurious rooms of the hotel to gather wedding ideas and inspiration and most importantly chat with expert wedding vendors face to face to help make wedding planning and decision-making that little bit easier. COME TO THIS YEAR'S EVENT on APRIL 14th. LEARN MORE HERE. Guests arrived under a gorgeous silver balloon arch created by Lunar Balloons and greeted with a glass of bubbles before heading in for a quick photo op in front of a lush wall of greenery. Guests were then invited to wander the hotel’s many event spaces and take in all the wonderful ideas on display. There were elegant table settings with gorgeous centrepieces, cake and dessert tastings perfect for a little afternoon treat (we were huge fans of the doughnut chandelier), live entertainment and photo booths for a little fun. We were incredibly excited to be involved throughout the day too, with the New Zealand Weddings Bridal Fashion Show. 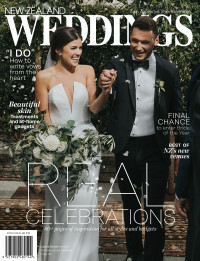 The show was split into five segments; bridesmaid looks by Amber Whitecliff e , two segments of bridal fashion featuring gorgeous gowns by Yolan Cris from Novia Brides and two segments of dapper looks for the groom and his groomsmen by Munns . The runway show opened with Amber Whitecliffe’s beautiful bridesmaid dresses in blush pinks, floral prints and deep blues and burgundies. By showcasing such a wide variety of dress styles and colours, brides were sure to find a look they loved and would suit their style and colour palette for their wedding day. The bridesmaid looks were followed by five men’s looks by Munns with a more fun, less traditional feel, featuring pops of colour through the ties, pocket squares and shirts. This was followed by four additional looks with a more classic vibe – think three-piece suits, tuxedos and bow ties. And finally the breathtaking Yolan Cris bridal gowns. Stocked by Novia Brides in Wanaka, this Spanish designer is known the world over for designing breathtaking bohemian chic bridal gowns. Voluminous skirts, intricate lace and floaty sleeves were just some of the focal points of these elegant gowns. The wonderful team from The Beauty Hub created all the hair and makeup looks for the show. We'd like to extend a huge thank you to everyone, from the Cordis Auckland for inviting us to be involved, to those who helped us pull off the show itself Amber Whitecliffe, Novia Brides, Munns, The Beauty Hub, 62 Models, Lunar Balloons and La Lumiere. Plus, the wonderful product in our goodie bags from Linden Leaves, Mellow Cosmetics, Sparkling OH, Eylure, Scotch, Fortune Cookies and Avene. The Best Views of Auckland | Event Space!